Internet sales are forecast to account for 15%-20% of the food and beverage sector’s overall sales by 2025 — a potential tenfold increase over 2016. This signals big opportunities for food and beverage packaging converters that can anticipate the evolving needs of brand owners and consumers. It also raises two key questions: How will the product look on the digital shelf and will it arrive at the consumer’s doorstep intact? This Executive Insights looks at the critical challenges facing packaging converters and retailers when it comes to both primary packaging and secondary packaging in the digital age. The future looks bright for all things ecommerce in the food and beverage sector, fueled by Amazon’s purchase of Whole Foods, a growing millennial consumer base and increased consumer adoption rates driven by retailers’ push to improve the user experience. But this optimism isn’t confined to grocery retailers, meal kit companies and food-delivery outfits. 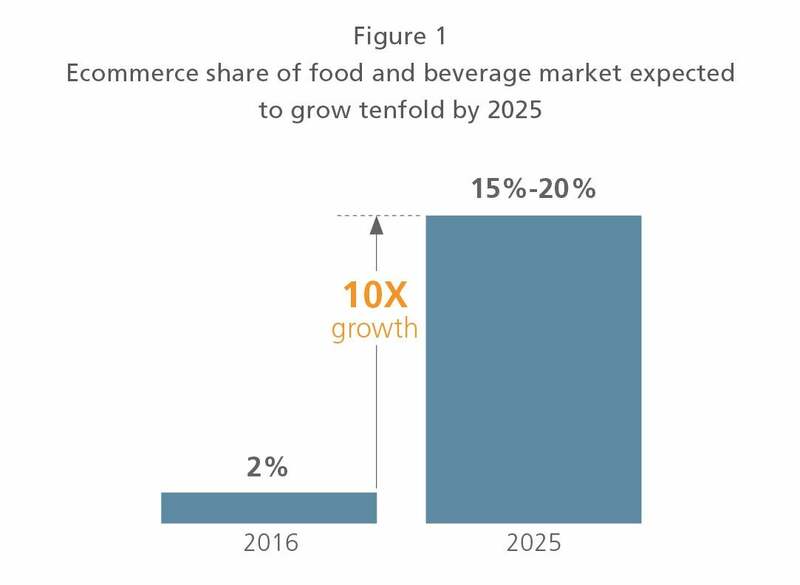 Internet sales are forecast to account for 15%-20% of the food and beverage sector’s overall sales by 2025 — a potential tenfold increase over 2016 — which foreshadows big opportunities for food and beverage packaging converters that can anticipate the evolving needs of brand owners and consumers (see Figure 1). And the payoff could be just as lucrative for food and beverage brand owners that can thoughtfully and strategically adapt their packaging to an online promotion and home delivery model. In this Executive Insights, we discuss why ecommerce penetration rates have been historically low in the food and beverage sector — and why we believe the market is poised for significant growth. We also analyze the unique and urgent challenges that packaging converters and brand owners face when it comes to primary and secondary ecommerce food and beverage packaging. What do the key players need to consider as they position themselves to win in this brave new world? Can the digital shelf compete with the real thing? Historically, low food and beverage ecommerce penetration rates have been fueled by both a dearth of affordable, quality ecommerce options and consumer inertia. First, brick-and-mortar grocery retailers typically see low-single-digit profit margins due to the high cost of managing perishable products and cold-chain distribution. No exception to that rule, ecommerce retail grocers struggle with the same challenges of balancing overhead with affordable retail prices. Consumers have also driven lagging sales, lacking enthusiasm for a model that has seen challenges in providing quick fulfillment and delivery service — especially for unplanned or impulse buys. Many consumers also prefer to physically select products such as fresh produce and meats themselves. It’s the so-called banana problem (i.e., being able to choose based on whether the consumer wants a very ripe banana for banana bread or prefers a relatively unripe banana for snacking). What’s driving the projected 18-percentage-point increase (2% to 15%-20%) in the online share of food and beverage sales by 2025? Millennials, unsurprisingly, are leading the charge (see Figure 2). 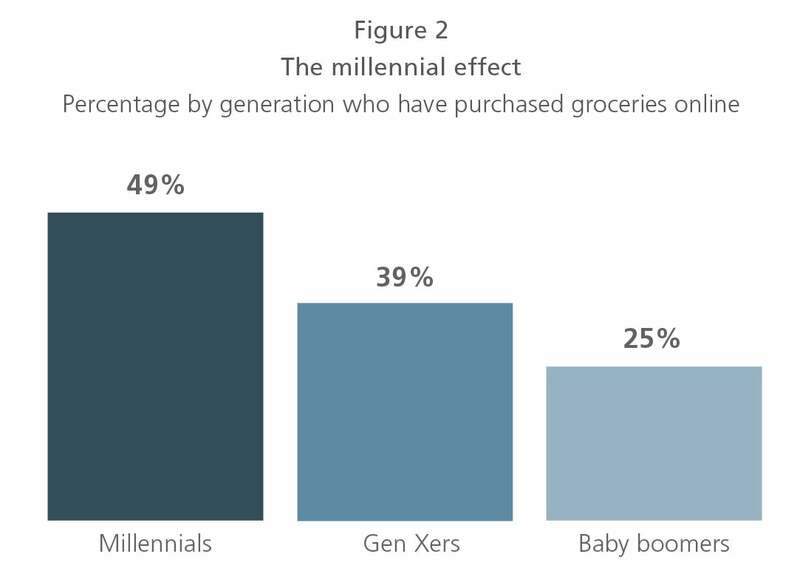 Roughly half of this plugged-in population has purchased groceries online (versus just 25% of baby boomers), and L.E.K.’s 2018 Consumer Survey suggests those numbers will surge over the next 12 years as the millennial consumer population matures. In fact, millennials are projected to account for 40% of all U.S. discretionary spending within the next two years. The optimistic outlook isn’t just limited to millennials, though. Consumers as a whole are expected to purchase more of their groceries online, as retailers and direct-to-consumer (DTC) brand owners tackle obstacles that have plagued adoption by improving online platforms and ensuring sluggish fulfillment becomes a thing of the past. According to the 2018 L.E.K. Consumer Survey, 34% of consumers anticipate purchasing over 40% of their groceries online in the next 12 months, up from the 22% of consumers who currently do so. Consumers aren’t the only driving force. New partnerships and business models continue to emerge following Amazon’s acquisition of Whole Foods and Walmart’s acquisition of Jet.com, upping the competition among brick-and-mortar grocery retailers (see Figure 3). Looking forward, warehouse automation and new delivery methods (e.g., drones, autonomous cars) are expected to decrease operational costs and take customer service to the next level. All told, online food and beverage retail numbers look to be on the upswing after a consistently meager ecommerce performance. But are brand owners fully prepared for ecommerce’s effect on primary and secondary product packaging? And is the packaging ecosystem ready for what’s next? Packaging that works for a brick-and-mortar store doesn’t necessarily prove successful for online promotion and “last mile” delivery, and as the food and beverage ecommerce landscape evolves, primary and secondary packaging will have to keep pace. Brand owners — and subsequently packaging converters — will feel the effects in different ways depending on which food and beverage ecommerce segment they primarily play in and how they sell and deliver their products. First, let’s take a look at the three broad segments of the burgeoning food and beverage ecommerce market, which are driven largely by consumer shopping and consumption behavior (see Figure 4). Grocery delivery and pickup: “Click and collect” brand owners use the same primary packaging for in-store and online sales, as online orders are fulfilled by the brick-and-mortar stores. This segment is adapting the packaging in a variety of ways. For example, heavier substrates (e.g., metals, glass) are being switched out for lighter substrates (e.g., plastics, paper), and there is greater usage of supplementary protective packaging to prevent leakage/damage in the last mile (e.g., film overwrap around closure). Unlike click-and-collect orders, grocery full-basket and limited-basket delivery orders are fulfilled through a central warehouse and don’t require identical primary packaging for in-store and online sales. However, many brand owners continue to use the same packaging to maintain brand consistency, particularly as most companies view product packaging as an important in-home marketing tool. In this model, providers more commonly utilize traditional logistics/shipping carriers to fulfill via parcels, which may require incremental protective packaging in the last mile (e.g., void fill, cushioning, wrapping). Looking forward, there is potential for grocery full-basket and limited-basket delivery brand owners to utilize separate, no-frills packaging solely for the ecommerce sales channel. This packaging, however, would likely be limited to high-volume/high-consumption products, with an additional layer of secondary packaging that can be simplified. For instance, brand owners could package center-store foods, such as snack bars, in less-expensive multipacks that are shrink-wrapped or overlapped in lieu of the expensive cartons used for in-store sales. Consider Amazon’s frustration-free packaging, which was introduced in 2008 in the hopes of ending “wrap rage.” Amazon works with manufacturers to design cardboard boxes that contain their products and can be sent directly to the consumer — called “ship in own container” — eliminating the need for an additional shipping box. DTC products, meal kits and fresh ready-to-eat meals: Brand owners typically sell their products exclusively online, so product packaging already accounts for the last mile as well as additional secondary packaging/packing material (e.g., insulated boxes, bubble wrap, honeycomb, dry ice). Meal kit delivery brand owners typically use expanded polystyrene (EPS) and EPS substitutes (e.g., specialty multibarrier insulated cooler bags) in outer packaging, while films and vacuum bags are used for ingredients. Restaurant meal delivery: Sustainability appears to be at the forefront of this segment’s packaging needs. EPS is losing share to sustainable food-service packaging made from agricultural byproduct pulps (e.g., clamshells). And packaging is increasingly being used as a point of differentiation among meal-delivery consumers, who typically are younger, more educated and more environmentally conscious, or for consumers who don’t want to deal with the hassle of extra packaging. Food and beverage brand owners and packaging companies find themselves at a crossroads where brick-and-mortar and ecommerce packaging intersect. How do brand owners position themselves to win in this changing digital landscape? And how do packaging companies meet brand owners’ shifting demands for food and beverage products being sold through the ecommerce channel? Let’s take a look at the critical challenges that packaging companies and brand owners face when it comes to both primary packaging (what the consumer takes out of the box) and secondary packaging (what protects the product from the store/warehouse through the last mile) in the digital age. Food and beverage brand owners and packaging companies find themselves at a crossroads where brick-and-mortar and ecommerce packaging intersect. How do brand owners position themselves to win in this changing digital landscape? And how do packaging companies meet brand owners’ shifting demands for food and beverage products being sold through the ecommerce channel? Let’s take a look at the critical challenges that packaging companies and brand owners face when it comes to both primary packaging (what the consumer takes out of the box) and secondary packaging (what protects the product from the store/warehouse through the last mile) in the digital age. Challenge 1: Is what you see what you get? Most consumers have been there: They’re online and poised to click “buy.” But they hesitate because they can’t “see” the product, whether to size up the cereal box, determine the banana’s degree of ripeness or read the ingredients on the bag of gluten-free cookies. Consumers use their five senses to interact with the product and primary packaging in brick-and-mortar stores but can’t do so online. Thoughtful digital display and primary packaging become critical. Consider a product’s relative size and value, which are less evident on the digital shelf. Cereal boxes, for example, seem uniform in dimension on Amazon.com despite obvious differences on a brick-and-mortar store shelf. Relative size isn’t the only issue. Digital product images are smaller, and as a result, any text is more difficult to read on mobile devices. Messages such as flavor cues and product claims (gluten-free, organic) can get lost on small screens. The overarching challenge for retailers and packagers is this: The physical product that arrives on the doorstep must meet the consumer’s expectations based on the digital display. Some brand owners have employed solutions such as investing in new product images specifically designed for the digital shelf. These images might display additional ingredient flavors or show the open box to ensure the consumer’s expectations will not be dashed at the doorstep (see Figure 5). Challenge 2: Can marketing go beyond the last mile? Packaging is a key marketing tool for the brand, not only on brick-and-mortar and digital shelves but in the consumer’s home as well; purchasers interact with packaging once it reaches their front door. Packaging remains in the consumer’s home after purchase and continues to communicate the brand’s message to the purchaser and anyone else in the home, including family members and visitors. Packaging also prompts the consumer to reorder. Imagine a soda bottle in the fridge. It’s eye-catching and colorful; it shouts “refreshing.” Anyone who opens the fridge sees it, and the brand name and product stick in their mind each time. And while at-home packaging must be appealing and convey the brand message, it must also communicate product attributes or guarantees, whether it is “easy to use,” promises “leak free” storage or contains “fresh” food. If the product delivers on the packaging’s promise, the consumer is more likely to reorder. This presents a conundrum for both brand owners and packagers. While there is a temptation to create no-frills primary packaging solely for the ecommerce sales channel (e.g., Amazon’s frustration-free packaging), brand owners should proceed with caution, as there is a risk the consumer will perceive the ecommerce product with downgraded packaging (e.g., DTC wine shipped in corrugated packages) to be inferior to the retail product. Even with food and beverage ecommerce penetration forecast to increase significantly, many consumers will still shop through the omnichannel (i.e., through both ecommerce and traditional retail channels), and primary packaging will need to reinforce a clear brand identity across multiple channels. Are key brand and product messages continuing to be effectively communicated? Is the packaging image optimized for the digital first moment of truth? Does the product packaging match not only the digital shelf graphics but also the quality expectations set for the consumer? Does the packaging translate from digital shelf to physical manifestation of the brand experience? Will the packaging serve as an effective marketing tool within the home, creating consumer loyalty and prompting repeat purchases? Does the primary packaging used in the ecommerce channel reinforce a clear brand identity in traditional retail channels? Challenge 1: Will it arrive in one piece? Secondary packaging (i.e., the packaging that protects the primary packaging) introduces a set of incremental challenges that don’t exist in the traditional retail channel. Consumers who purchase products from a brick-and-mortar store are responsible for taking the product through the last mile — and packages have been engineered with that in mind. The ecommerce channel adds a new layer of accountability for brand owners and retailers. Not only must they take the product through that last mile — they must ensure it makes that journey intact. Successful protection from leakage and damage is critical to food and beverage ecommerce penetration. Bottled water or soup, for example, may require additional secondary packaging support (e.g., multilayer film overwrap to ensure that the product does not break during transport). Or consider the comingling of fragile products such as potato chips with nonfood items such as laundry detergent, or the shipping of cans that are shaken during transport. Brand owners are increasingly looking to packaging converters to design secondary packaging solutions that will prevent shipping-related damage yet still offer a packaging opening experience that surprises and delights the consumer. Challenge 2: Does box size matter? Gone are the days of shipping costs based on weight only. In the past, retailers had the option of shipping lightweight products in large boxes and using “void fill” products such as crumpled paper or air pillows to keep the product from moving within the box during transport. Now, major shipping players UPS and FedEx have moved to “DimWeight” or dimensional-weight pricing, in which both weight and box size impact freight expenses. Brand owners and packaging converters, including DTC product and grocery-delivery companies, are racing to find solutions to “right size” boxes — that is, to fit the box to product dimensions rather than the other way around — in order to reduce shipping costs. This includes DTC product and grocery delivery companies. Some solutions include “box on demand,” in which equipment makes a corrugated box that is specifically measured, cut and folded to the exact dimensions needed by the product. With box on demand, void fill to prevent nonfragile product (e.g., a box of pasta) from shifting within the box becomes less important and may be needed only for protection of the more fragile items (e.g., a glass jar of pasta sauce). Other solutions to make DimWeighting more affordable include heavily padded flexible mailers (often plastic, paper or hybrid), which provide the benefit of protection and smaller dimensions relative to a box, though they may work only for select food product categories that are well-protected already (e.g., a box of granola bars). While some of these box right-sizing technologies are on the market today, there are still meaningful technical barriers to mass adoption (e.g., equipment speeds). Brand owners and package converters must assess packaging based on their specific category to ensure the product will be protected through the last mile — for example, a 24-pack of water requires different protective packaging bullseye overwrap than does a jar of pasta sauce (e.g., closure film with cushioning). With the advent of DimWeight pricing, brand owners must ensure they’re utilizing the most cost-effective shipping model for their specific category and must consider right-size boxes if needed. Ecommerce sales in the food and beverage sector are projected to increase significantly by 2025, up 18 percentage points from 2016 levels (2% in 2016 to 15%-20% in 2025). Food and beverage brand owners and packaging converters alike should plan now for the onslaught of online sales that is sure to come, bearing in mind that brick-and-mortar product packaging won’t necessarily be as effective in the digital age. The twofold purpose of packaging as a powerful marketing tool and as a protector during the last mile invites two questions for ecommerce retailers and packagers: How will the product look on the digital shelf and will it arrive at the consumer’s doorstep intact? Ancillary considerations arise, too, including in-home marketing beyond the digital shelf and innovative packaging/shipping options such as box on demand. Those who can thoughtfully and urgently act upon these implications will be the ones who pull away from the pack.